The Hill is alive with the sound of Cornell’s musical organizations every Homecoming weekend—it’s tradition. 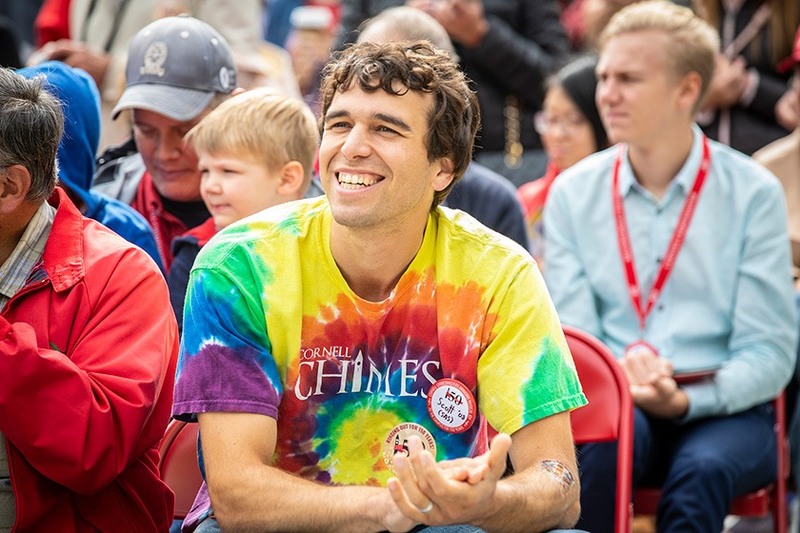 But during Homecoming 2018, the familiar sounds of the Cornell Chimes and the Cornell University Glee Club had special meaning because both celebrate 150 years of making music this year. The chimes first rang out over the Ithaca campus in 1868, at the university’s opening ceremony. They rang out again—as they have three times a day almost constantly since that first year—during a sesquicentennial celebration concert the Saturday of Homecoming weekend. The audience enjoys a concert of the Cornell Chimes from Ho Plaza. 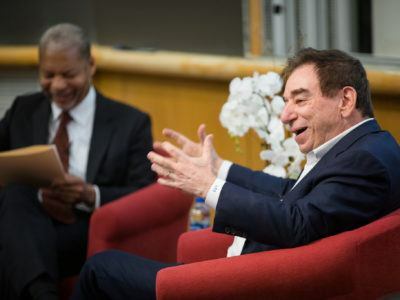 “One hundred and fifty years means we are a defining tradition of the university,” said Lane McClelland ’70, JD ’74, a chimesmaster and the daughter of Cornell’s first official female chimesmaster, Phyllis Dittman ’43. 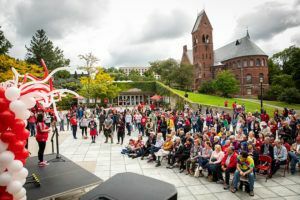 A crowd of more than 100 gathered at 11 a.m. on Ho Plaza with a view of McGraw Tower, where the bells are housed, for a program of Cornell Chimes history and music. As emcee, Devan Carrington, assistant director of Residential and New Student Programs, told the story of the Cornell Chimes and its importance to the university. The audience on Ho Plaza watched on a screen as the current chimesmasters played through a sample of the Cornell Chimes repertoire ranging from the hymn “Old 100” and “Give my Regards to Davy” to “You Are My Sunshine,” multiple Beatles tunes, and the theme music from the Harry Potter films. “It’s amazing to see so many chimesmasters together at once,” said Emma Jacob ’20, one of the current chimesmasters who performed. More than 80 attended the Chimes reunion and celebration—48 of them chimesmasters. The Ho Plaza concert was only the beginning. Additional weekend events included an exhibit in the Cornell University Archives of items from the Cornell Chimes collection, evening dinners, an architectural tour of the tower and Arts Quad, “and of course lots and lots of bell ringing,” said Marisa LaFalce ’96, chimes program coordinator. “Open chiming,” as chimesmasters call it, was a huge part of the weekend. 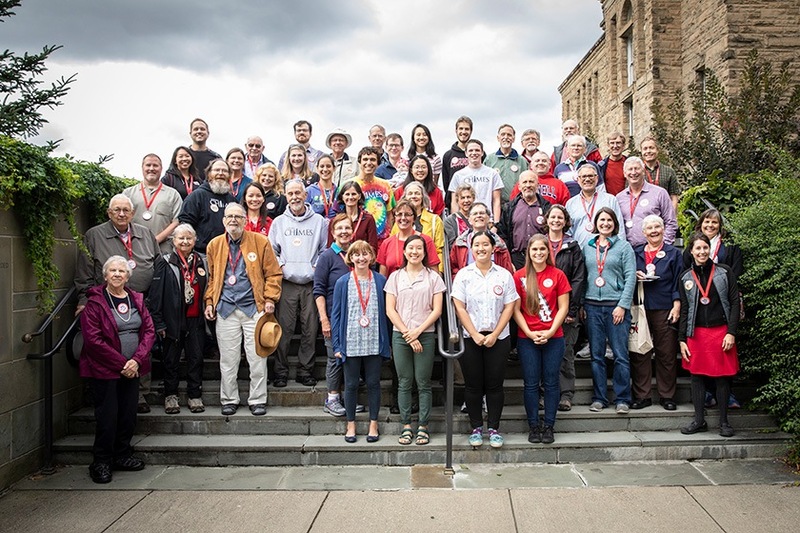 Alumni and current chimesmasters gathered in McGraw Tower for several hours on Friday evening and Saturday afternoon, and again on Sunday afternoon to play number after number for each other—and for the Cornell campus and the Ithaca community. “It’s all very public,” said Daniel Zlatin MS ’80, who traveled from Ontario to take part in the celebration weekend. Chimesmasters, said Zlatin, are “a strange bunch,” few in number but great in history. 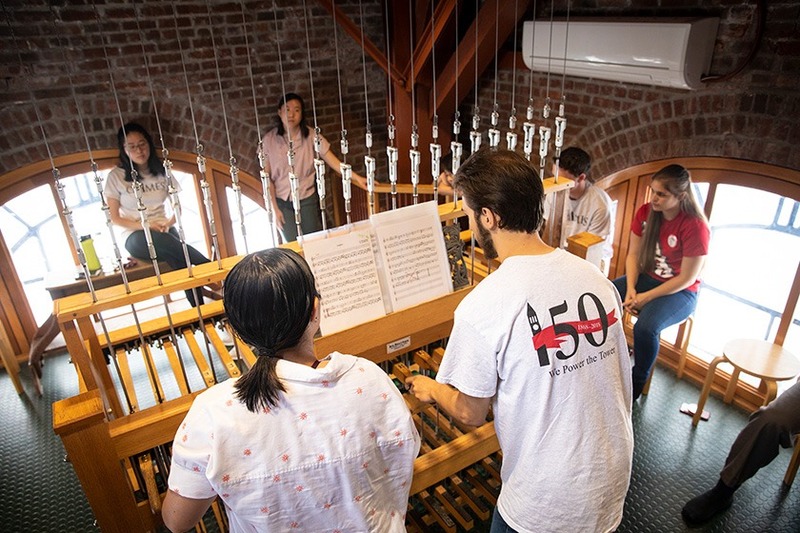 While other Cornell musical groups gain many new members each year, the chimesmasters, with about seven active at a time, gain only two or three new members each academic year. 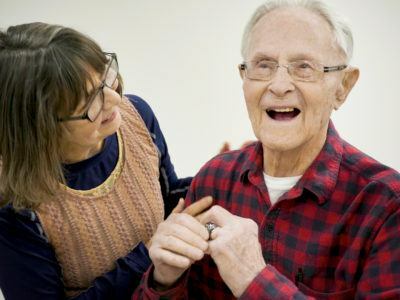 Tradition is a key value shared by chimesmasters of every generation, said LaFalce. An aspiring chimesmaster must complete a 10-week competition that has remained largely unchanged for the last century. 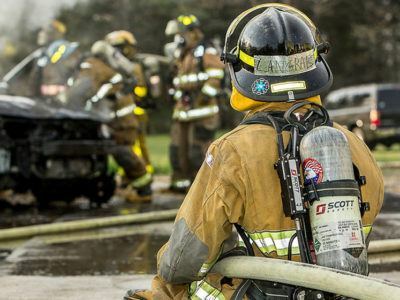 This strong grounding in tradition has kept standards high for the program for so many years, even as the program continues to evolve. Looking forward into the next 150 years, she said she hopes the musicality of the Cornell Chimes will continue to grow. 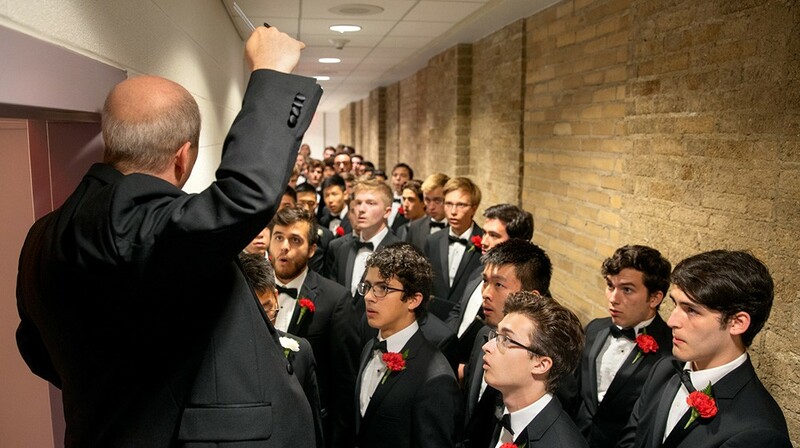 On Homecoming weekend, the Cornell University Glee Club, the university’s oldest student organization, started a full year of events celebrating its sesquicentennial. Alumni joined a rehearsal on Friday, and current members sang “Happy Birthday” to the Cornell Chimes during the Saturday afternoon concert. Saturday evening, the ensemble paid special tribute to the 150 years of its history during the Homecoming concert. “It’s a real honor for me to stand here with this storied ensemble,” said Robert Isaacs, assistant professor and Priscilla Browning Director of Choral Programs, during the concert, which also featured the Cornell University Chorus, the Glee Club’s “sibling” organization for treble voices, founded in 1920. Robert Isaacs, assistant professor and Priscilla Browning Director of Choral Programs, leads members of the Glee Club in a warm up backstage. Founded as the Orpheus Glee, Mandolin and Banjo Club in 1868—the first year that students populated the two-building campus—the Glee Club held its first concert in January 1869. In a nod to the past, the Homecoming 2018 concert featured a number titled “Gentle Annie” accompanied by two members on mandolin and one on banjo. A video of historical footage and photos created by current Glee Club members set the tone for a historical celebration. Chants of “1-5-0! 1-5-0!” broke out in the audience after the 55 current members, together with 40 alumni, performed the ensemble’s signature piece, an arrangement of “Ave Maria” for seven parts by Franz Biebl (1906-2001). Alumni of the Cornell University Glee Club join the current members of the ensemble to sing the alma mater. 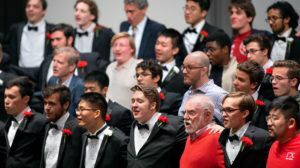 “Homecoming weekend was the kick-off for our year-long celebration of the sesquicentennial of the Cornell Glee Club,” Isaacs said after the weekend. Glee Club alumni have been planning for a decade or longer. “It’s been exciting to get to know the students who are in the Glee Club during the sesquicentennial,” said Isaacs. January 2019: national tour with stops in New York, Boston, Washington, DC, Los Angeles, San Francisco, and other cities. The tour will involve local alumni in each city in rehearsals and performances. 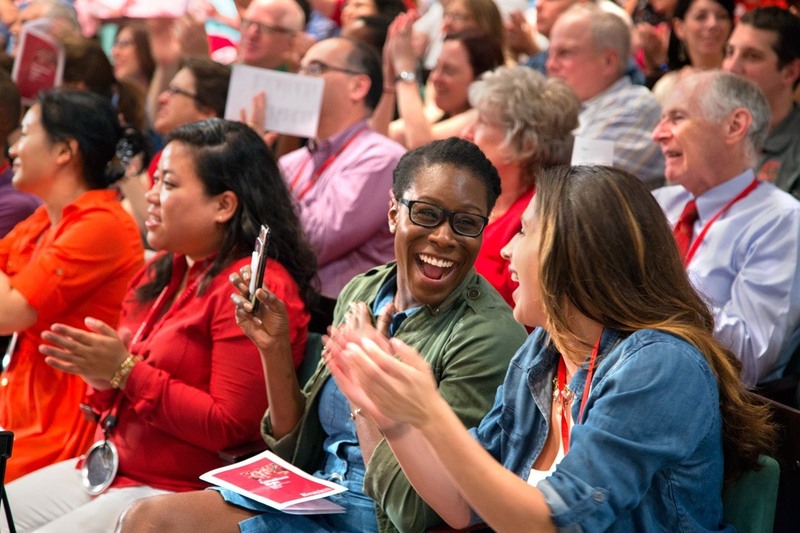 June 6-9, 2019: Cornell Reunion 2019, still in the planning phases, will be the culmination of the year-long celebration, including a gala luncheon, talks, discussions, and a concert worthy of 150 years of Cornell musical history.